With their optimistic sing along anthems and their massive line up, I’m from Barcelona has proved that, sometimes, less is not more. The story begins in the summer of 2005 when Emanuel Lundgren decided to record some newly written pop songs on his vacation. He gathered all his friends in the city of Jönköping and before he knew it he had formed the biggest band in Sweden. One live show led to another and by early spring of 2006 the band signed to EMI and the EP ”Don’t Give Up on Your Dreams, Buddy!” was released, soon followed by the full-length album ”Let Me Introduce My Friends”. The song ”We’re From Barcelona” became an instant hit and was one of the most played songs on Swedish public radio. The video, directed by Andreas Nilsson (The Knife, José Gonzales, Yeasayer), is a YouTube success. 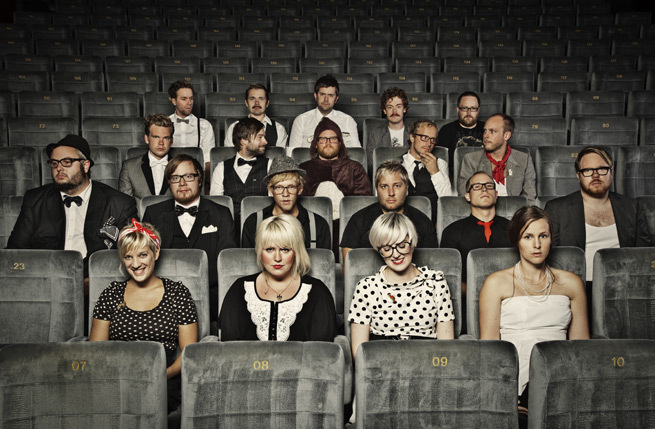 The band was rewarded ”Best newcomer” by the listeners of Swedish radio (P3 Guld) and nominated for a Swedish grammy the same year. They soon started touring all over the world. The band is famous for their explosive birthday-like live shows, playing festivals such as Lollapalooza, Coachella, Roskilde and Eurockéennes. They do full-house gigs in Paris, London, New York, Los Angeles and San Fransisco at venues such as La Cigale, Bataclan, Koko, McCarren Pool and El Rey. The band’s recordings has been feautured in many TV shows such as “How I Met Your Mother”, “Grey’s Anatomy” and “Yo Gabba Gabba”. On the second album ”Who killed Harry Houdini?” (2008) streaks of melancholy was fused with the trademark I’m from Barcelona sound. In 2010 the dream of ”27 Songs from Barcelona” came true. It’s a collection of one solo song from each member of I’m from Barcelona, released as a triple-vinyl. Favourite hobby: In the loving arms of technology, behind screens or under strobe lights. Favourite song: Ewan – The Radio Dept. Favourite hobby: Second to music, Fishing!